You know when you just don’t know what you feel like for lunch? Sometimes you feel like a movie star, sometimes you feel like a baker, or even a truck driver. Ignore those feelings and get into bread, bread with anything on it at all. Okay, not yucky things like – well, I won’t say because I don’t want to insult the gourmands among you who may like those yucky things. Go ahead, buy a baguette and go wild. This entry was posted in Help Desk and tagged baguettes, black cat, cartoons, cheese, comics, fish, Help Desk, lego, minifigures, office, phone, sculpture, skunks, tuna on August 29, 2018 by Jay Verney. While 9 out of 10 cats prefer to stay out of the way when centaurs are stomping around (innocent tails and all that), the other 14 have no issues with them at all. In fact, felines and centaurs tend to group together to gossip about the latest social media mythological trends over lattes and ceviche at every opportunity. Prove me wrong, go on. 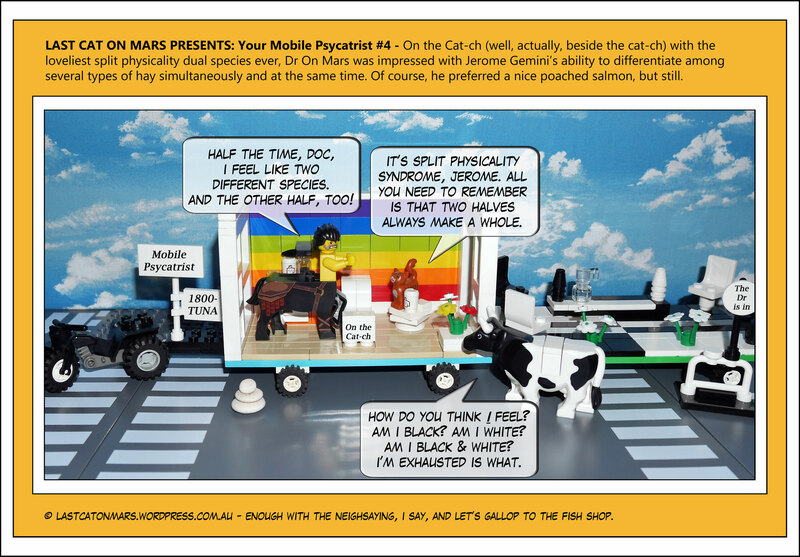 This entry was posted in Variety Show and tagged cartoon, centaur, comic, cow, Dr on Mars, lego, minifigure, mobile psycatrist, psychiatrist, psychiatry on August 22, 2018 by Jay Verney. 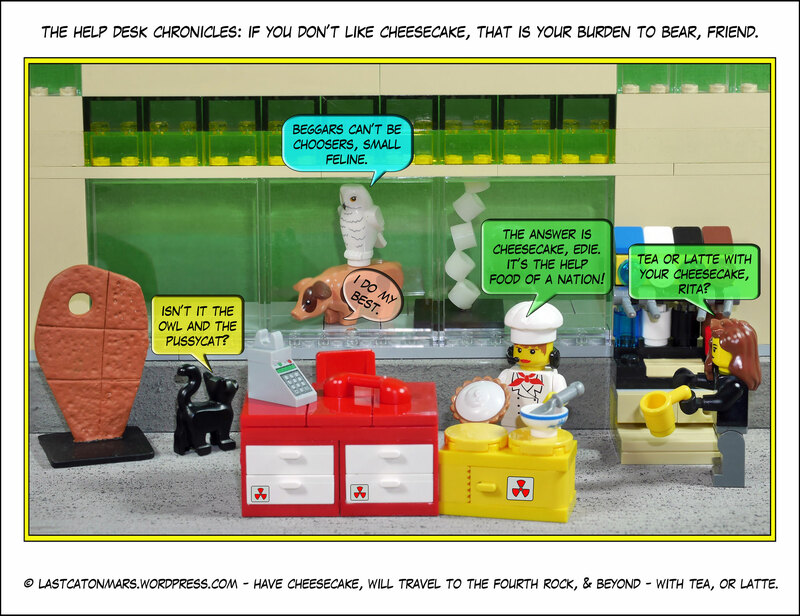 Last Cat On Mars Presents: The Help Desk Chronicles – Cheesecake, Burden or Bonus? Despite the headline up there, we all know that the humble yet fabulous cheesecake, could never be a burden, not even on your hips. Well, perhaps on your hips, but be selective, slice it thin like an after dinner mint (think how many thin slices you could have before you reach even an approximation of a full serving, think and feel all fluttery and happy). This entry was posted in Help Desk and tagged black cat, cartoons, cheesecake, chef, coffee machine, comics, Help Desk, lego, minifigures, office, owl, pig, sculpture on August 15, 2018 by Jay Verney. Yes, friends, you’ve guessed that I have a soft spot for the game of Chess, though I do not play it very well, or at all, really. I have issues with strategic planning involving war-like games, but that by no means diminishes the tomfoolery and malarkey one can enjoy with happy japes about the various representations of pieces and their predilections. Jeez, that was exhausting, I’m off to play a round of draughts/checkers with the nearest nerdy Martian. This entry was posted in Variety Show and tagged cartoon, chess, chess pieces, chessboard, comic, lego, minifigures, truck on August 8, 2018 by Jay Verney. Sitting here on Mars on a lazy Sunday afternoon, I thought of a few things, and, well, here you go lovers of Ancient Egypt and Barbara Hepworth. Also tuna. This entry was posted in History, Sculptures, Variety Show and tagged Ancient Egypt, art, artists, Barbara Hepworth, Egypt, mummies, sculpture on August 5, 2018 by Jay Verney. 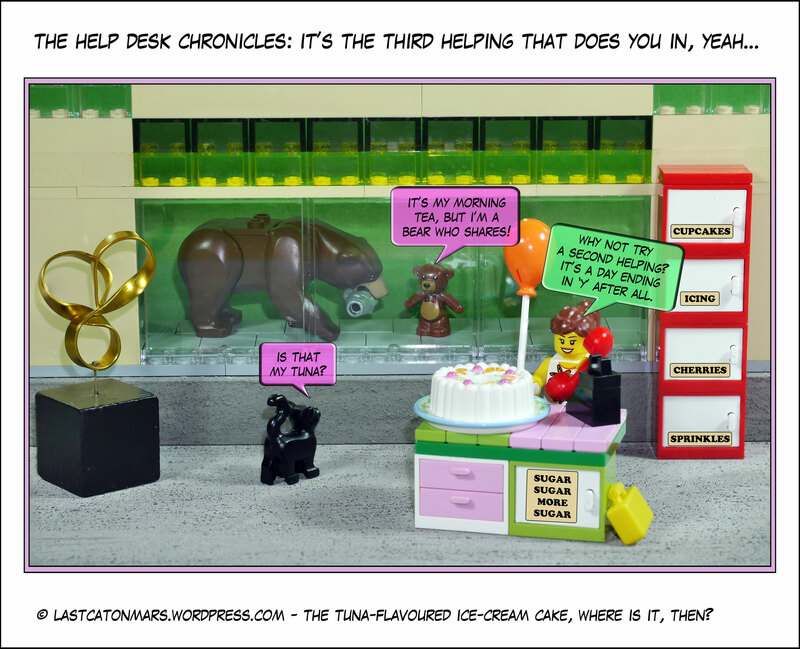 Last Cat On Mars Presents: The Help Desk Chronicles – Would You Like A Second Helping? It’s all very well to say restraint is the new black, or red, or whatever, but you and I both know that a lovely second helping of helpful tuna cheesecake never hurt anybody. Dig in, dudes and friends. This entry was posted in Help Desk and tagged baby bear, bear, black cat, cake, cartoons, comics, fish, Help Desk, lego, minifigure, office, sculpture on August 1, 2018 by Jay Verney.